Posted on June 10, 2017 by Oregon Coast Wasabi. Someone once exclaimed to me that: "....wasabi is nearly impossible to grow...". "Nonsense!" I replied. And so have thousands of others each year. The following are some of our customers' plants and gardens. All of these customers have provided permission to use their communication and photos and used the below offer. If you're an existing, past or future customer, remember this offer: 50% your next purchase from The Wasabi Store: Submit your photo(s) of your wasabi plant growing (or harvested), and information you think would be helpful to other wasabi growers. For example, provide the date planted (approximate), growing environment (soil and amendments), nutrients added, potted or not, watering cycle etc. Post this on Instagram with #wasabiplants #growingwasabi #exoticplant #FreshHotReal #homegrown #freshwasabiroot #womenofwasabi #freshwasabi #wasabi #FrogEyesWasabi OR on Pinterest (https://www.pinterest.com/FrogEyesWasabi/) Send the photo(s) and information to Info@TheWasabiStore.com and your approval to use it and we may put it on the blog. If it's posted at any of the above, we will contact you to ask you if we may use the photo on the blog. For any future order, provide your name and email info@theWasabiStore.com for your discount code.
" I finally did it! My first "big" harvest after two years:) Thank you so much for your dedication and education for this plant. It has been a great gardening experience! Best wishes Robbie (from eureka ca;)"
That looks a very healthy and tasty wasabi there Mr. Olson! @rottenkoala grew a rhizome in Portland Oregon. And I love the nail polish color. That's enough for at least a few sushi rolls. Mr. Chang in Utah is growing these in a pond in a gravel substrate. " "I've received the order yesterday and planted them already. By the end of the summer we shall see the result. I've already use the leaves to make Ozuke with pickled plums and shiso leaves. I'm planning to make some pesto sauce and salsa verde out of some. I'm going to incorporate them in my ramen somehow. Thank you for making wasabi possible in the States." Growing in the corner of the house in a shady spot and a wine barrel. "Jennifer, here are some better pictures of the 4 plants I got from you about 3-4 months ago. They are all planted in Black Gold choir potting soil. All get a sprinkling of bat guano that is infused with good soil "bugs". I water with a mix of about 1/2 tablespoon of Epsom Salt mixed into a gallon of water and a tiny pinch of Miricle grow. The plants from you have been living in the garage since the cold and snow started that last week of December. Temperature in there has held between 45-50 degrees. I do take all of them outside on days when it is over 45 and let them soak up some of our liquid sunshine. Posted on March 15, 2017 by Oregon Coast Wasabi. A frequent question we receive is about cold tolerance. In this post, I'll document two freezing episodes in Portland Oregon in Dec. 2016 with garden plants. Potted Plants: Dec. 8 2016. Temp. +28dF with light snow approximately 0.25 inches. Note the drooping stems and wilted leaves. These two were potted in the early summer of 2016 at Frog Eyes Wasabi Farm and then brought to Frog Eyes HQ in Portland Oregon in about late September 2016. Potted Plants: Dec. 12 2016. Temp. +45dF. Snow melted within 24 hours. Note the erect stems and flat leaves. Some of the slug work / damage was present prior to the snow. It's unknown how much was existing. But, I'd imagine the slugs were hungry after one day of snow. These plants are brassicas; slugs and aphids are common pests. Barrel Plants (barrel #2) Dec. 8 2016. Temp. +28dF with light snow approximately 0.25 inches. Plants covered by snow and all stems are low and nearly flat. Barrel Plants (barrel #2) Dec. 12 2016. Same time as above potted plants. Note the erect stems and flat leaves. Note the lesser about of slug work / damage. Elevating the plants off the ground helps reduce pest damage (from slugs at least). Potted Plants Jan. 2 2017. This photo taken during a period of low temperatures at 16-20 degrees Fahrenheit (-9 to -6C). The duration was approximately 5 days, with the high temperatures below 32dF (0dC). The center plant was wrapped / covered in typical bubble wrap to determine if any difference is noted between the uncovered and covered plants. Potted Plants Jan 11 2017. During a rare Portland snowstorm approximately 5 inches of snow. Temperatures won't reach above freezing for about 48 hours with a low temperature to the low 20's Fahrenheit. I haven't unwrapped the center plant yet. It will warm up tomorrow and I'll do so. Jan. 25 2017: They seem to have all survived! The small one on the left was turned over and fell out of the pot. I was at the farm and didn't re-plant it for a few days, at least one of which had a night that dropped below freezing with exposed roots. They may not be totally happy, but they seem to have survived and are making a go at it. Go little wasabi plants go! The one that was wrapped, the middle one seems to be the happiest with greener leaves. But, both the larger potent plants are, just this week, producing flower buds! This plant amazes me at every turn. New flower buds on the right. I'm sorry they are blurry. Feb. 25 2017: All three potted plants survived. They are all flowering. Barrel #2 plants on Jan. 2 2016. These were left uncovered as an experiment to determine if any difference is observed between the potted and barrel plants and the uncovered and covered potted plants. These temperatures, and particularly the duration are quite outside the typical wasabi preference (and frankly outside of mine as well). It will be interesting to observe the recovery process. Barrel #2 with a snow blanket. Jan. 11 2017. Jan. 25 2017. Barrel #2. All of the plants seem to have survived. They even are producing small shoots already, just one week after the freezing temperatures stopped. Showing new shoots from the apical meristem on Jan. 25 2016 from a Barrel #2 plant. Barrel #2 also survived. The perimiter plants at the 1 and 2:00 position sustained some cold damage, but they are returning. Posted on December 11, 2016 by Oregon Coast Wasabi. First I want to reiterate that our home garden wasabi planting is intended to approximate a laissez faire gardener environment, with no special treatment, hot and dry conditions in the summer and cold in the winter (relative to the Oregon Coast) to test the plants' response. See this former blog post for more. This was done to such an extent that we intentionally did' t follow our own recommended planting instructions. Thus, I've structured this blog episode into "our preparation" and "recommended preparation" which is the information that accompanies plant start purchase packages. I can assure you that we are not laissez faire at the Frog Eyes wasabi Farm - and not about much else if truth be told. But, I want to assure the readers that there's no special treatment or hidden magic being applied to the plants in our home garden (this garden needs a name don't you think?). 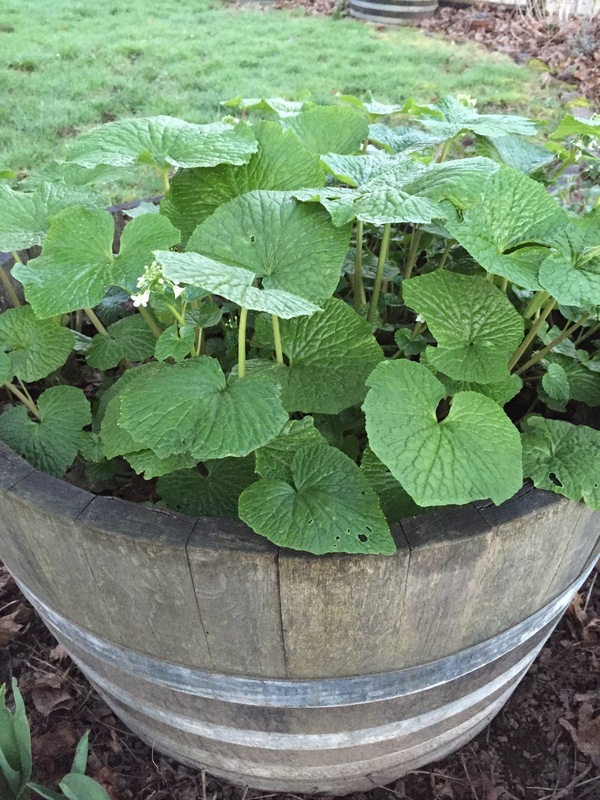 This summer, 2016, I planted an additional wasabi plant start half-wine barrel with an intention to display the correct way to plant wasabi and the incorrect way and the results. Our Preparation: (Note, this is what I did, and not necessarily best practices.) Soil/media: First, I planted a half-wine barrel using store-bought organic potting oil and about 25% large, 1-inch pumice for drainage and oxygenation. Sunlight: Unlike the initial barrel that receives sunlight in late January and early February in the early morning, I placed the barrel in a location that receives sun in months 3/4 and 8/9 at about noon for about 1.5 hours. This to increase the sunlight strength at a much stronger solar period. I planted small plant starts without leaves and larger ones with leaves. This was done to display the plant's accommodation of inhospitable conditions at different growth stages. I also planted at the hottest week and driest week of the entire year, with temperatures at 100dF and humidity between 15-30%. Choose a well-drained location with sufficient organic matter. If you’re planting in a pot the container size should be 10 inches or larger (a 2.5 gallon minimum). Work in 10-12 inches of compost to a soil depth of 8-10 inches. Wasabi requires a neutral or slightly acidic soil pH of 6-7. Plant your start only deep enough to keep it upright. Being sure that all of the roots are covered, backfill the hole and gently press into place. Do not cover the rhizome, it needs to be exposed above the surface. Wasabi plants can reach 24 inches in height so space plants at least 12 inches apart. Water well, but do not let the plant sit in drainage water. After initial planting irrigate regularly with cool water. Mist as necessary to keep plants cool and to avoid wilted leaves. Mulch may increase moisture retention, which will be especially beneficial during warmer months. Leaves that have been wilted for a week or more should be removed to deter pests and lower the risk of disease. Keep the planting bed or containers weed free and fertilize regularly with a balanced, all-purpose fertilizer. Fertilizers or foliar sprays rich in sulfur may improve the flavor of the rhizome. Cultivation: In its natural habitat you will find Wasabi growing on the shaded wet banks of cold mountain streams. When grown in a home garden Wasabi does best in full shade with steady temperatures between 50-60°F, although the Daruma variety is slightly more tolerant of heat and light. Temperatures below 40°F may slow growth and temperatures below 27°F can kill the entire plant. Temperatures above 80°F can begin to cause heat damage as well as increase the risk of pests and disease. So take this into consideration when selecting a planting sight for your Wasabi. As seen, there's loads of sunlight. We do not recommend any direct sunlight at any time of the year. Wasabi grows in alpine streams at elevation and under evergreen canopy. If one should err on sunlight or shade, give wasabi shade. Our Method: The larger plants were potted. 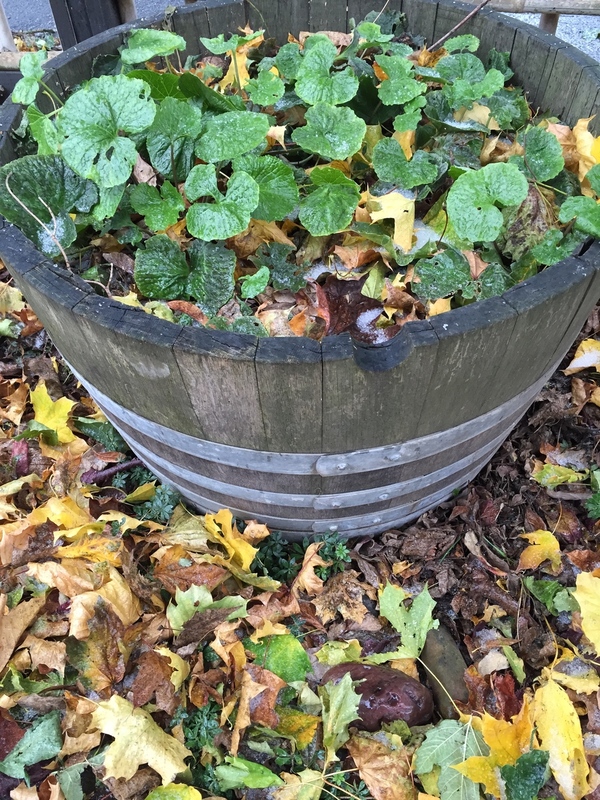 Continuing on the laissez faire gardener condition, they "rested" on the side of the currently-planted wasabi barrel for a few weeks, receiving no sun, and some water and routinely being kicked over by our faithful hound. The first photo below shows the potted plants prior to planting and the volume of pumice used for the top layer of potting soil and the sunlight. Showing the potted plant hole depth. I add a bit of pumice at the bottom of the hole for root drainage. Photo taken several minutes later after the sun was shaded by the house. This photo shows the backfill to the potted plant hole and the plant spacing which is about 8 inches on center. This photo shows the new plant starts that are new. This is how the first wine barrel's plants began. This photo shows their size and the bare root condition. This is how The Wasabi Store ships plant starts. They are nearly always successful, unless planted on the hottest day and driest day(s) of the year and with direct sun. The potted plants were once just like these about two months ago. I recommend that if you order plant starts in the summer to plant them in a cloudy and cool week. If they arrive during a hot spell, keep them in the refrigerator in a plastic bag and wrapped in a wet muslin or paper towel (just like the storage instructions for the mature rhizome). They will be much happier in the cool, damp refrigerator. These are not your typical plants. Don't panic about "getting them in the ground as soon as possible" or other common plant-planting axioms. I'd recommend the maximum time in the refrigerator is 3 weeks. If it's going to be that hot during your summer, wait to plant in the autumn so the plants are established for the following summer. Having planted the small starts just like the others. Soil almost, but not up to the bottom of the stems. Don't worry about root oxygenation like other plants. Don't pack the soil. Just water and let the water weight pack the soil. Oxygenation is encouraged, not discouraged. See how the plants are planted with soil just to the bottom of the rhizome? That's the correct depth. More soil can always be added later. It's better to not smother the plants and allow air in, rather than make too damp an environment. Showing one week later after the heat wave. The small starts are dry. The established plants have endured the incompatible conditions. Showing apical meristem growth in an established plant just days following the heat wave. They actually grew during this time. Showing small leaves in the center, the apical meristem growth again. This week is cool and rainy. I'll have an update on the small plant starts in about 10 days. Wish them luck on their recovery! Pests and Diseases: Wasabi is a member of the Brassica family. Pests and diseases of this family include: aphids, cabbage and alfalfa looper larva, crane fly larva, and slugs. The best defense against pests and disease is to maintain the cool temperatures and stable irrigation wasabi prefers. Pruning wilted or diseased foliage, hand removal of slugs or use of slug bait, and removal of aphids and other pests is beneficial to the plants health. Use caution when using any insecticidal soap or any other insecticides. If any fungal disease is detected it is recommended to remove the plant away from all others to try treating it, or dispose of the plant entirely. Copper spray can be useful in the presence of any fungal complications. Harvesting: If conditions are optima, within 24-36 months from the initial planting, you may harvest a four inch or larger rhizome. In the meantime, you may harvest the petioles (leaf stems), leaves and flowers that bloom in the early spring. All parts of the plant are edible. However, overharvest of leaves can lead to slower rhizome growth. The whole wasabi plant is edible. Enjoy harvesting and eating the leaves and leaf stems raw or cooked while you wait for your rhizome to grow! When your rhizome is ready to harvest it is recommended to hand dig the plant out of the ground or pot. You can then remove the plantlets that have formed around the crown to be potted or planted and expand your wasabi crop. Trim away the roots and stems and enjoy your fresh wasabi. Update: Late September 2016. The plant starts that had no leaves all died. I've not seen such a rapid demise. This was because I planted both on the hottest week of the year and with some direct sunlight. The plants simply were brought beyond their tolerance at such a young age. The other plants continued to grow and are thriving. Lesson: if it's too hot, keep the plant starts in the refrigerator or initiate them outside the garden and wait for a period of appropriate days. This photo was taken on the same day as the above. This plant was started in the pot and, though planted at the same time (hottest day .....), it is continuing to grow. Posted on September 1, 2016 by Oregon Coast Wasabi. 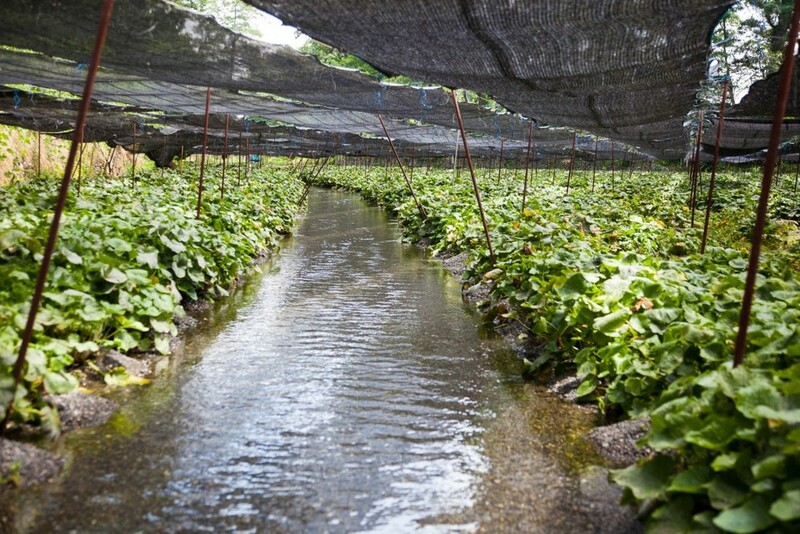 Wasabi Fans, We receive frequent requests to tour the Frog Eyes Wasabi Farm. Honestly, we'd love to accommodate everyone. We love sharing our produce with our customers. This creates a problem as, for various reasons, we cannot provide farm tours. To solve this problem, the good folks at the Zagat Guide created a fantastic video of the Frog Eyes Wasabi Farm. The video chronicles the harvest process and includes the grand finale of grating the rhizome fresh a the farm. This is the tour we would want to provide every one of you that request(ed / s) a tour. We hope you enjoy the tour. As evident on our media page, Jennifer has been the subject of many past videos. She wanted to take a breather on this one. Hint, somewhat like "Where's Waldo" spot the faithful farm dog Sam in nearly every segment. We hope you enjoy this video. We are very grateful to the creators and producers of this video. We think they did a fantastic job and created an entertaining and informative narrative. Posted on January 9, 2016 by Oregon Coast Wasabi. Crib notes from this entry: the black is just oxidization and actually seals in flavor and heat. The white shoots are edible and quite tasty. Order more wasabi than you think you'll immediately use because it should last for two months - and once you have the fresh, hot, real wasabi you'll use it more in your cooking (see this page for the many culinary uses). Before devouring this entry, I recommend reading the preceding entry, How Long Does It Last (Part I) for reference. That referential entry anecdotally describes the wasabi rhizome's preservation ability. In that post/entry, I described informing demo customers that the wasabi rhizome they just sampled was stored in the refrigerator for two months. We also provided a comparison to freshly-harvested with no discernible flavor difference. This entry (Part II), shows what a two-month old rhizome looks like, preparation, presentation and an unexpected spontaneous gift from the wasabi rhizome. The below rhizomes are over two months old and were placed in the bottom of a standard residential refrigerator vegetable drawer bin and frankly, neglected. They were moved about, jostled and shoved aside after each week's farmers' market trip to make room for beets and summer greens. They were wrapped in a (at one time damp) paper towel in a plastic bag; which comprises the basics of our recommended storage procedure. The white shoots all grew without the benefit of photosynthesis and is typical of post-harvest wasabi starting at about six weeks (see this recent entry about planting wasabi plant starts with white shoot growth). Bonus, unexpected, spontaneous gift: the white shoots are edible and actually quite tasty. But that's not the purpose of this post, but was included in this previous entry. So, your long-in-the-tooth wasabi in the bottom of the refrigerator is still fine to grate up, will still pack a heat and flavor punch and has these delicious little flavor-packed shoots that your guests likely have never seen or tasted and will be a great dinner conversation topic. So, go ahead, order a bit more wasabi rhizome than you expect to use immediately and keep it until (from now) Christmas or longer. It'll be fine and you can grow fun, edible (and safe) things in your refrigerator! Essentially, if the wasabi does not stink; eat it. The oxidization is millimeters thin and is shown below. Though difficult to see, this rhizome tip is actually cutaway (reference the thin cut line about mid-point in the rhizome orientated top-to-bottom). This oxidization layer is nature's natural flavor wrapper. It's edible - though for flavor sake I don't recommend eating it - it is not mold. The wasabi rhizome essentially seals itself from the degratory effects of oxygen. Think of it as nature's Rustoleum (trademarked / etc. I'm sure). I typically scrape it off with the back of a knife. A standard peeler can also be used, though I this usually removes more rhizome flesh than I would prefer. To use these older rhizomes, remove the amount remove the oxidization from the length of rhizome that you want to grate as shown below. Wrap these rhizomes back up in the same damp paper towel in the same plastic bag and I would imagine that they would be good for another month or so. The cut area of the grated area will re-oxidize and reseal the rhizome. Just remember remember to not put it at the very very back of the refrigerator because it can freeze and that will make the rhizome mushy. Freezing will affect the consistency and it will reduce the flavor as the heat. These qualities are retained in the cell walls, which, once broken releases the heat and flavor. The water inside the cells is released by the freeze-related expansion. It's like the cracks in a mason jar glass that was completely with water and put it in the freezer. So everyone, enjoy your wasabi and don't be afraid to buy more than you might need because shipping is expensive and the rhizomes will last for a long time and it will grow these white shoots you can put on a dish and people will be rather amazed - and we hope, quite pleased as well. Posted on November 3, 2015 by Oregon Coast Wasabi. Wasabi Fans, Note: these white plants starts were planted in Oct. 15 2015. The update photos below were taking on Nov. 8 2015. See the closeups of the apical meristem that are growing. The leaves are dried, crinkled and brittle (also tough). That's due to the lack of watering. They will flush out again when the rains come or I start watering. In fact, on this photo below, the primary rhizome/meristem has died away, but an offshoot is growing. The wasabi plant, when stressed, will send out offshoots that will become dominant if the primary rhizome suffers. I expect this plant to do the same. Now, to the planting. I used offshoots from Frog Eyes Wasabi Farm. These offshoots were in the refrigerator for approximately two months. They grow these white stems much like Belgian endive. The rhizomes and offshoots will both do this. They are actually quite tasty. I decided to leave them on. I also am using these to show that the offshoots, even after being stressed and "out of the ground" for two months and nearly aerobic in the bottom vegetable drawer, will grow just fine. If these grow, the ones we provide fresh from Frog Eyes Wasabi Farm should also grow just fine. Remember to view the growing recommendations on our website. All I did was use a trowel, dig a hole, insert the offshoot and replace the soil and water. The white tops make the new plants more visible. I'll provide more updates as these grow and mature. Remember, that one of the reasons to plant in the winter is that the offshoots grow all winter and like other brassicas, the leaves and stems are all edible and will be a source of fresh greens in the dead of winter. Add wasabi to your kale garden and brussels sprouts and you've got healthy greens in the winter! What a difference some water and shade (not sun) makes! The new plants and the existing year-old plants are doing quite well. See the first photo below compared to the first photo in the above Oct. entry. New growth abounds. The below is a white-shoot plant start shown above. The green color has returned and fresh shoots are appearing. Note, this is the one at about the 11:00 position shown above in the October entry. All the new plant starts are doing well. Even after enduring being uprooted several times by squirrels. This photo is a one-year old plant that is an offshoot from the dried-out and dead central rhizome shown above. See the blackened remnants of the rhizome on its side just beside this new shoot? And see how much healthier these new shoots seem from just a few weeks ago? Some rain and lack of sun (shade) really help reinvigorate these plants. Posted on October 16, 2015 by Oregon Coast Wasabi. Garden wasabi in Barrel "A". The Original barrel (1 of 2). On Oct. 1 2016. Wasabi Fans, We prefer to plant wasabi in the early autumn. Though Spring is traditionally the universal crop-planting season to prepare for the summer sunshine, wasabi grows fastest during the transition seasons; Spring and Autumn. Thus, planting to prepare for these seasons is important to establish the plant starts. Think of wasabi as garlic; plant it in the autumn so it establishes and is ready to take maximum advantage of early Spring. We do this at Frog Eyes Wasabi Farm and recommend it for the home garden as well. This timing takes advantage of the cloudy day of Spring which establishes the plants so they flower in late Winter/early Spring. Depending on your location, your springtime may be too hot or dry for wasabi to really take root. As long as your winter doesn't freeze too hard or long (below 25dF or for more than 48 hours duration), I think Autumn is the time for you. This photo was taken approximately two months after planting in Sept. 2014. This was the first ice storm of the season. Look closely and the leaves are very shiny from the freezing rain. The plants above are the same ones and indeed survived the winter (though not the neglect and heat of the summer). Indoor is ok, just make sure to NOT put it under a light. Remember, we as an agriculturally-centered society, we think of food products being grown in open fields with lots of summer sunshine. Though wasabi is indeed a food crop in that sense, it does not thrive in sunshine. I can't stress this enough. It is the primary reason wasabi doesn't flourish in gardens or long enough to become a food crop in your backyard. This plant wants shade. All year. 365 days per year. Potted wasabi plant (shown outside, but taken inside for the winter). Garden wasabi in Barrel "A". On Oct. 1 2016. Garden wasabi in Barrel "A". The Original barrel (1 of 2). On Nov 10 2016. More leaves, More canopy coverage. Leaves are lighter color (more water). Reference all the new growth in the foreground. Also note the medium size leaves. Where, in October, the leaves were either large or small, the new growth in October to November provides more canopy. Garden wasabi in Barrel "B". The second barrel planted in August 2016. On Oct. 1 2016. Garden wasabi in Barrel "B". The second barrel planted in August 2016. On Nov 10 2016. Posted on September 14, 2015 by Oregon Coast Wasabi. Wasabi is not a root. Please reference the photo below for a visual of the wasabi plant's roots. Horseradish - though a close botanical cousin - grows underground. Wasabi grows above the ground. As wasabi is a brassica, it's related to broccoli. Wasabi is a rhizome, which is essentially the stalk or trunk of the plant like the broccoli stem. Though the growth patterns are different, it's this stalk that gets grated to become the paste. The roots are below ground and the green bits are all above ground. This plant shows the roots, offshoots (the side shoots at the base) and the central rhizome (behind and slightly obscured by stems - sorry for the difficulty). The offshoots are removed and the rhizome trimmed. We trim all our rhizomes by hand, with hand tools. The above photo shows Jennifer harvesting the above-shown plant. The plants are surprisingly large. This full plant weighs approximately 4 pounds. Below is the fully-trimmed rhizome. Note: the stems were removed from this rhizome for weighing purposes. It’s 130g 4.5oz which should be sufficient for dozens of customers’ full sushi dinners. Posted on September 8, 2015 by Oregon Coast Wasabi. Wasabi Fans, Frog Eyes is strutting its stuff at the 15th Annual Wild About Game hosted by Nicky USA meat purveyors. Join us at the Resort at the Mountain on October 11th for a taste of all of the cook-off action and to sample your way through the Jacobsen Salt Co. Artisan Marketplace, featuring the best bites and sips in the Northwest. Tickets on sale now at MercTickets.com The match ups have all been set and the game has been paired for the Game Cook-Off Competition at Wild About Game. We can't wait to see what this amazing group of chefs cook up with our signature Nicky Farms game meats. Wasabi is quite versatile with proteins. With the diversity of meat on offer, food fans, epicureans and gourmands will be able to determine which type of meat that best pairs with wasabi. We will be hosting a table and providing wasabi samples. Rumor has it that we may even have a wasabi-infused vodka for the after party (yes, it's infused with Frog Eyes Wasabi). Taylor Stark from Departure Restaurant in the Nines hotel in Portland (executive chef is Gregory Gourdet of Top Chef and a friend of Frog Eyes Wasabi) and beef from Nicky's source Creekstone Natural Beef. Wasabi and Steak is a Japanese delicacy for a reason. Wasabi pairs well with nearly any protein (and starch for that matter - mashed potatoes or cold noodles is particularly good). Wasabi Fans. Wasabi is indeed a great garden plant. It grows in full shade and can withstand lots of rain, doesn't get out-competed easily and best of all, it's all edible. Combine wasabi with brussels sprouts, and kale and you have greens through the winter. The past several months I've been showing off my garden wasabi (that which is not grown in the greenhouses at Frog Eyes Farm). The below photo example is from the springtime showing full, lush plants. The latter photos are taken last week after a very hot and dry summer here in the valley (as opposed to the coast where Frog Eyes Farm is located). I've not taken my own advice on this blog and I didn't water daily I averaged once each three days. These plants also received full sun for a couple of days for a couple of hours; also violating my previous recommendation. But, it was an experiment and will continue to be one. I'll update this blog on the conduit of these same plants as the days grow cloudy and the rain commences. I estimate half of the plants will return and sprout healthy edible leaves once again. Those plants with a healthy apical meristem will be fine. This autumn, I'll plant some garden plants following my advice and show a comparison between the two. This was taken in the late spring 2015 after several months of growth (the plants were planted mid September 2014). The following were taken in late August 2015. Same wine barrel; same plants. Posted on August 31, 2015 by Oregon Coast Wasabi. Wasabi Fans, I hope you're as excited as we are. We have great news all around. 1. We expect to harvest our first crop of 2015 in late October. We apologize for the delay. We want to assure that the crop is uniform in size to continuously harvest from that date forward. The test harvests have good, green rhizomes (aka "roots"). They are sweet, hit several taste registers, are hot and have a pleasant aftertaste. Please sign up on the waiting list and we'll send you specifics when they are available. As the old saying goes: first come-first served. Here's a taste (pardon the pun) of the new crop. It grates up nice and green. The taste lingers more than previous crops with a constantly pleasant sweetness with no bitter aftertaste. 2. We are replanting two additional greenhouses. This will, in one year, increase our weekly output. The difficulty is that the Oregon Coast gave up Spring and put on its Hawai'ian shirt and didn't show any sign of the typical June Gloom which can either seem like November or March depending on which way the wind is blowing. This means that with the heat, (lack of fog) the plants grew a bit more slowly than typical this summer. Thanks to the El Nino warm water blob. But, my opinion is that the plants are concentrating flavor and heat. This crop tastes wonderful. It's uniformly healthy and robust with a delicate taste. Again, thanks of reading and I'll soon send out some food tasting notes from our first few events of the wasabi re-release. Posted on August 16, 2015 by Oregon Coast Wasabi. Posted on August 7, 2015 by Oregon Coast Wasabi. Wasabi Fans, Do you know the feeling when somebody tells you that the thing you've created excites them? Well it's a rhetorical question, but please indulge me while I tell you how it feels to me. It's the primary reason I do this. Providing something that brings people pleasure on so many levels: the obvious palette pleasure, the pleasure of something new (for many), the pleasure of fond memories (for some), and the pleasure of helping others refine their art (cooking in this case). I get as much pleasure as my customers; if not more. And, how to feels to have that pleasure returned in the form of an appreciative article - and one that was produced without my prior knowledge? Few other things in life feel that good. So, the following article is a little about wasabi, wasabi in the PNW and why wasabi is so rare and appreciated. If (when) the ambient air temperature surpasses 80dF, the plants will stop growing and likely wilt (particularly if not watered daily). If this occurs, keep watering; maintain hope, they should regrow once the temperatures drop again. Do not compost the plants; they are only waiting for the temperatures to drop again. Remember, wasabi is really hardy. See our blog post about plants being in the refrigerator for 8 months in a totally sealed/anaerobic environment and still growing. If you garden is too hot, keep watering, or if you planted them in a sunny location, use this opportunity to transplant them. The plants in the shrubbery below are under the blackberry hedgerow. They've been there for 5 years. We've been monitoring them. We tossed offshoots here as an experiment. No watering, no tending, no special sauce, no care whatsoever (and no sunlight in the summer months). The plants are growing each year. They reduce a bit in summer and rejuvenate in Autumn and really reinvigorate in the Spring. If these are any example for you; keep watering. Wasabi's natural habitat is alpine streams; under fir canopy and in or near streams with that cold water and air cell around it. (Ever walk near a stream on a hot summer night when the air was still and the temperature drops ~15d?) Once the plants are outside their desired conditions, they rebel by shutting down to preserve energy. Just don't let them get dry and they should rally once the scarves return to your wardrobe. Posted on June 15, 2015 by Oregon Coast Wasabi. Wasabi rhizomes can grow in the garden. Absolutely they can. Ours did. No secret sauce added. We planted these in September 2014. Several months later, a small rhizome with enough paste for a sushi dinner for a few diners. We used a couple handfuls of 14-14-14 fertilizer three times during the growing duration (note, the offshoots were planted in autumn and grew throughout the winter). These were just like the small, trimmed offshoots we sell. They grew happily in full shade (I can't stress this enough). They were planted in a wine barrel which had amended soil. That's it. The wasabi paste was spicy and tangy and would definitely accompany fish or do well in a sauce. The reddish colored paste is from the root area and is because it's a mazuma variety. The green colored paste is from the top of the rhizome and is a bit more watery, but definitely flavorful. Note that in photo two, there are little purple offshoots that could be broken off and replanted to propagate more wasabi in the garden. As wasabi suffers very little transplant shock, one could dig up the plant, remove the offshoots and then expand the wasabi patch. Next experiment: grow the rhizome in the garden, cut off the apical meristem and re-plant to see if it regrows (it does in the greenhouses at the farm). Also remember, the leaves and stems can be eaten at any time. The first photo is at ground height - it's a bit disorienting. The photos are in sequence from harvesting to grating. Posted on May 11, 2015 by Oregon Coast Wasabi. The rhizomes are getting larger each day. They are green, healthy, hot and flavorful. The flavor is really developing well. One of the joys of farming is to observe (read: taste and enjoy) the taste progression/maturation of your crop. The same is true with wasabi. The heat and flavor are much more developed at about 80grams than 30grams. I think the flavor even improves at 120grams. But, we got to enjoy our first dish with this years' budding crop. Our new friend Eric at Bar Avignon generously plied us with fresh Netarts Bay oysters and our other new friends at DeGarde Brewing generously shared their beer. I've told anybody that will listen that it's the best beer I've ever tasted. With wasabi the smoke flavor in the oysters really popped with that added heat. The sweet vegetable flavor really extended the oyster flavor and mellowed it somewhat. But, in the half shell, the sour beer with the brine was outstanding. I want Autumn to be here so I can share more rhizomes with friends and customers, but I am very excited for summer with oysters and a pint at the foot of Netarts Bay with our new friends. Posted on April 20, 2015 by Oregon Coast Wasabi. Rhizomes are here again! Just like the first flower buds of Spring, the first signs of rhizomes are bedazzling Frog Eyes Farm. They should add about 10 grams per month and be ready by about October 2015. We will keep updating this site. Please go to the website and get on the waiting list for rhizome availability notification. The small rhizomes have good color, taste and overall health. The sweetness is already forming well and nearly no bitterness. I'm looking forward to autumn steak, potatoes, big/bold riesling and a big dollop of wasabi. We are of course still selling plant starts through the website to the public, nurseries and burgeoning wasabi farmers. We will continue to sell these while we sell rhizomes to the culinary market. Posted on April 12, 2015 by Oregon Coast Wasabi. A few weeks ago, I harvested some leaves and stems from the wasabi plants in our garden (not the farm). I also promised that the plants would grow back. Well, they certainly did do just that. Don't be trepidatious to harvest leaves and stems. The >30% rule doesn't apply. Go for it. Make a memorable meal. The plants will be fine. In fact, for ours, even post- harvest the plants sent out even more flowers (which make a great tea by the way). For those buying wasabi starts, there are about 6 offshoots in this barrel. These are planted a bit denser than I'd recommend. Posted on March 31, 2015 by Oregon Coast Wasabi.